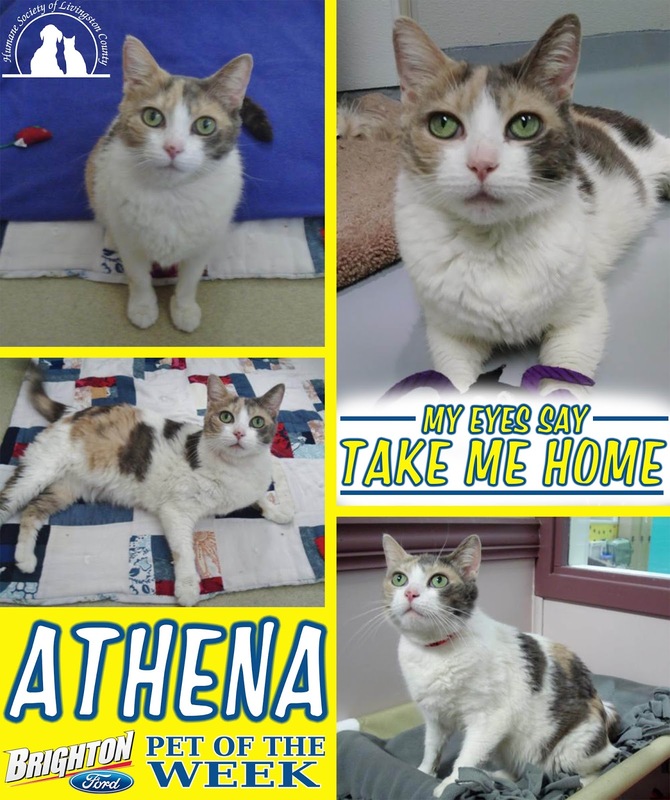 Hello, I’m Athena, a GORGEOUS, VERY SWEET, 7 year old (spayed) female Dilute Calico. I was transferred from another shelter to the Humane Society of Livingston County where, thankfully, I have received proper medical care to manage my diabetic condition. I’m feeling GREAT now and ready to find my new forever home! I’m a VERY SWEET and GENTLE soul looking for a home where I can relax, enjoy nature watching from the window, and be part of your family’s daily routine. I’m a VERY friendly girl who LOVES to snuggle and will quickly charm my way into your heart with my alluring green eyes and sweet ways. I would do best in a relaxed home where I can receive lots of your attention and may be ok living with a nice dog or cat who respects my space. Special needs: Athena’s diabetic condition will likely require insulin injections twice daily which she tolerates well. With good care, she can live a healthy, happy life. Our medical team will provide details to interested adopters. 12:00 pm Athena may bat a feather toy a little and use her scratching post. She is very good about not scratching furniture. In the rare case she tries, all we need to do is gently push her down and she stops instantly. 1:00 pm Athena sits on the couch and softly cries for attention. We come to see what is wrong. She just wants us to pick her up and take her into the room where everybody else is! She LOVES attention and to be held! 3:00 pm A visitor comes by the house. Athena greets them. We have not seen a stranger that she didn’t charm right away! She loves everyone! 5:00 pm We make dinner for ourselves. Athena is on sight to taste test for us! After a while, she goes back in her room because she is tired of the dogs. She does not particularly like them, but she copes well. We keep her separate from our other cat for now, but in time, they may get along. 7:00 pm Time for Athena’s evening insulin shot. Again, she is an angel throughout the very quick and easy process. Just a little poke and off she goes! I fill up her food and water again and clean out her litter box. 8:00 pm Athena sits quietly next to us as we watch TV together as a family. She is a very happy, sweet girl who is easy to please! 9:00 pm Time for bed. Athena gets some treats as we tuck in. She loves her treats! Whether you need a new Mustang, used Fusion or F-150, Brighton Ford has the largest selection of vehicles in Livingston County! Click here to find your perfect Ford truck, SUV or car to bring home your adopted pet in.